Klio - A Top European Brand. Est. 1900, sold world wide. 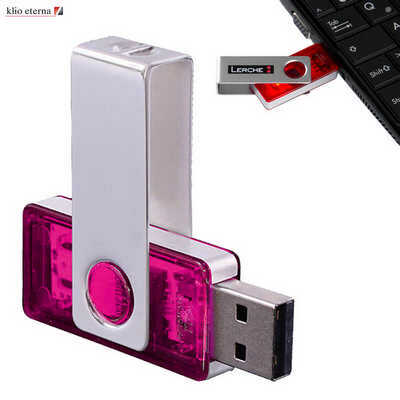 High quality Germany made USB drive with 1 year warranty. Capacity: 4GB. MIX & MATCH ---create your own USB drive. Select from Colours only in the range shown & we do the rest to make your own unique USB drive. Great for clients who want to match their corporate logo & Colours. Complete the set with our Klio pen range. Additions: Select one of our USB gift boxes to create a perfect corporate USB gift set. Clip: Metal: glossy silver, matt silver. Transparent Plastic: clear, black, blue, red, dark green, light green, purple, yellow. Solid Plastic: white, black, blue, red, green, yellow, grey, silver. House: Transparent Plastic: clear, black, blue, red, dark green, light green, purple, yellow. Solid Plastic: white, black, blue, red, green, yellow, grey, silver. Side Bar: Transparent Plastic: clear, black, blue, red, dark green, light green, purple, yellow. Solid Plastic: white, black, blue, red, green, yellow, grey, silver. Printing Area: Clip: 25 mm W x 12 mm H. House: 10 mm W x 15 mm H. Side Bar: 30 mm W x 4 mm H / 12 mm W x 4 mm H. Decoration Methods: Pad Printing, Laser Engraving, 4CP Digital Direct Print. Price includes : 7 days 1c/1p printed. Setup is not included, please ask for a final price from your sales representative.